This interactive whiteboard resource is the result of a suggestion in the comments on the Number Line IWB resource. The suggestion was to adapt the number line to allow it to be used to show elapsed time. The result is this interactive whiteboard resource. There are 2 clocks that have draggable fingers to set a ‘from’ and ‘to’ time. 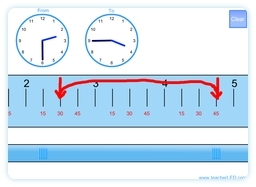 The number line shows whole hours and 15 minute intervals. You can annotate directly to this using the built in annotation and your notes will scroll with the number line. Using these tools you can demonstrate how to use a number line to calculate how much time there is between 2 given times. Like the Number Line resource the interface for this resource uses physics to allow you to use inertia to scroll along the number line by dragging on the bottom bar. It is hoped that this method is more natural for use on the IWB (but it is not so conducive to mouse control). Unlike the Number Line resource this number line does not bounce at the end of the scroll. Comments on the interface or further suggestions for development are welcome. Excellent. That’s the sort of thing I had in mind with this. I hope it is useful for you. Great idea for teaching elapsed time. My students struggle with this concept every year so I’m excited about trying it this way. How do I download the elapsed time number line with the clocks. Downloads are not permitted on the site. All resources must be used on line. This is the only way I can keep the site free – although remember that most subscription sites don’t allow downloads either. We’re starting elapsed time next week – looking forward to integrating this interactive resource! Thank you! This is what I was looking 4 ! Thank you for creating the number line. This saved me a lot of time and you know how time is valuable!